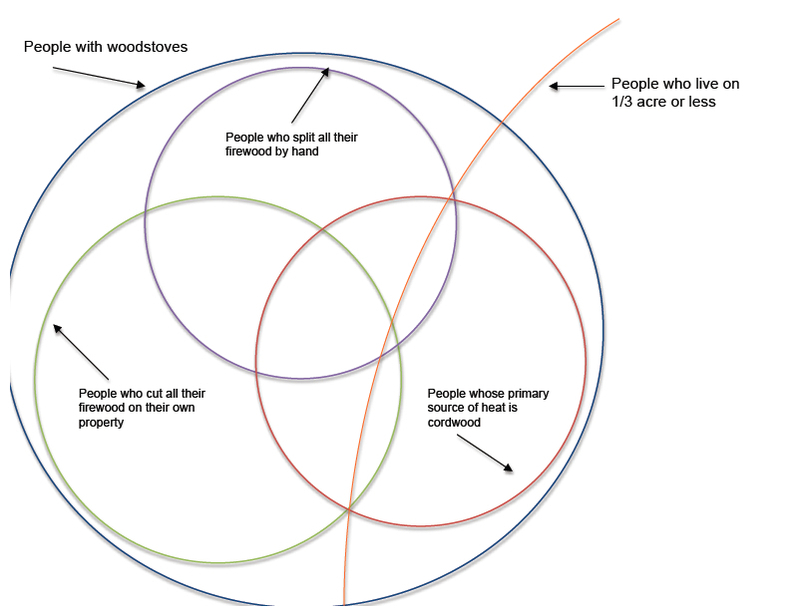 Can you locate the Cold House on the above Venn diagram? I wonder if we may be the only people in New England who fit into the sector contained in all the sets above. Okay, okay– it will only be temporarily true– this winter, next, and possibly the one after. There is only so much firewood that 1/3rd of an acre can produce– even at our laughably low rate of use, this is not a “sustainable” wood lot. But at the moment there are 2-3 cords of nicely dried Norway maple stashed away, all from the back yard, all split (and, more tiresomely, stacked) by me. Somewhere, waaaaay down at the bottom of the pile, there are still 20 or 30 pieces of the kiln-dried oak that we bought two cords of in 2009 (cost: $600). They may never be seen again. This entry was posted on September 20, 2012 at 9:59 am and is filed under General updates. You can follow any responses to this entry through the RSS 2.0 feed. You can leave a response, or trackback from your own site. Dear Mr. Venn, I did find your house on the map you sent me. You are indeed in a unique location. Good luck this winter. Hi – I am glad you are still posting. I have followed your posts for the past 2 winters from balmy Richardson, TX, fantasizing about cold weather living, annoying family & friends by keeping my house at 60-65 degrees throughout the winter. Happily, I moved to Alaska earlier this summer, and am about to brave my first Fairbanks winter, armed with a well-insulated home (rented), heated by a traditional oil-furnace baseboard heater system AND a ~new Jotul woodstove! Please keep posting!! Wow– Fairbanks– you will have plenty of opportunity to test out cold-living up there! Jotul– nice. What kind of firewood can you come by in that region? Birch is preferred, with spruce as another popular choice. We have aspen, but I don’t know yet about it’s availability for firewood. We are having an Indian summer right now (highs in low 60’s for the past few days), but temps are to fall to 20’s (low)-40’s (high) within the week…the owners of the house I’m renting are leaving 1.5 cords of birch for me…I will get another cord to supplement…with almost 50 days (average) below -20 for the season, I don’t know whether I can do with any less than that! I’ve been following Cold House for a few years. I stay in the farmhouse in Maine with it in the 50’s and am very comfortable. There is only a wood stove for heat. Now there is a chill in the air. I will confess, I don’t like cold weather. Maybe my blood needs to get use to it…. again. Time to bring out the wool sock and wool sweaters! I found this today after we wondered how many other people have discovered the benefits of turning down the thermostat. Our temperatures in the house are at about 55, as low as 52 on a cold, windy morning, and up to 70 when we light the fireplace with insert now and then. We wear sweaters, jackets and hats as needed, and love a good blanket when we sit on the sofa.